The street scribe has set himself up in the Via Tor de’ Conti just outside the Forum Romanum. In the background there is a glimpse of the gate leading in to the Augustus’ Forum, the so-called Arco dei Pantini, and the columns behind are those of the Mars Ultor Temple. The picture of the scribe writing a letter for a young girl is about love: This can be seen from the pair of doves sitting on the arch between the columns on the left. Thorvaldsen also included a similar pair of doves in the helmet of the god of war, Mars, at the feet of his Cupid Triumphant from 1823. However, there are also other details in the painting that tell of love, or rather the consequences of love: the pregnant woman holding a girl by the hand on the right of the picture, and the woman with the children on the left. And then it is possible to read the first three words in the letter the amorous young girl is dictating: “Mio caro Ernesto”. On account of his many years in Italy, Ernst Meyer was himself often called “Ernesto”, so Meyer has amused himself by painting himself into the picture – in absentia, as it were. He is the addressee. He is the one she is longing for. 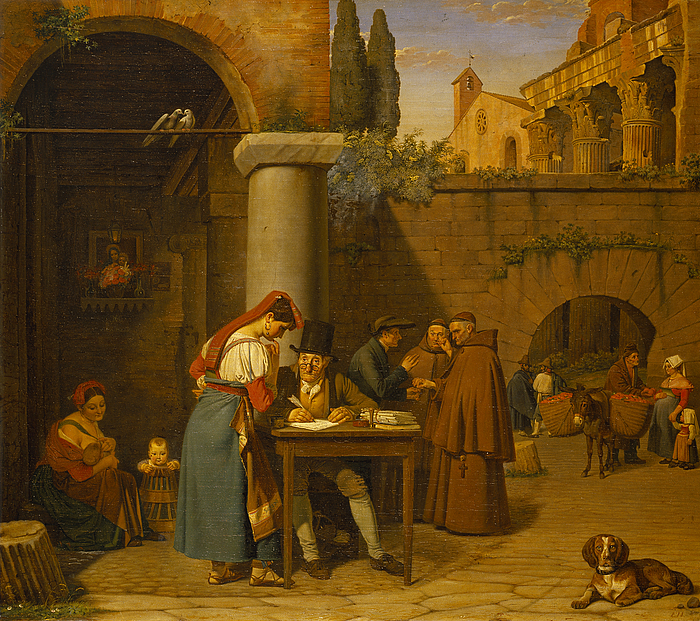 Meyer, who was born in Altona, had come to Rome in 1824 and remained there for the rest of his life – apart from summer visits to Olevano, Amalfi and other idyllic rural areas in Italy. He also made brief journeys outside Italy, for instance to Copenhagen, where he had studied at the Royal Danish Academy of Fine Arts, and to Germany.